To keep transmission lube from migrating forward along the clutch pushrod, there is a seal contained within the transmission input shaft. Moto Guzzi has never perfected this item on its big twins. It’s common to see a line of oil form between the engine and transmission cases. While in some cases (pun intended) the problem is an engine oil or transmission front seal leak, this o-ring is the most common cause. Guzzi’s first seal was a felt tube (GU1208-5900) that was updated after engine #2715 to a plastic tube (GU1208-5901). I believe this was a better sealing design than what came later although the plastic sleeve would wear the pushrod over time, resulting in a leak. Still later bikes have two cone-shaped rubber seals (GU1408-5900) that can quickly wear on their outside sealing surface, causing a leak in as little as 10,000 miles. But, at least the rubber cones don’t also wear the clutch pushrod. This can be accomplished with the transmission in the frame although it will require swingarm removal. With the way clear to the back of the transmission, begin by unhooking the clutch cable so that the clutch actuating arm may be swung clear. The arm presses on what is called the outer body which seals in the gear lube and presses on the throwout bearing, which is centered on the inner body. It is best to use a small pair of pliers to remove the inner body with the throwout bearing still in place so as to limit the possibility of the bearing falling into the transmission. With the inner body out of the way you can now pull out the pushrod. 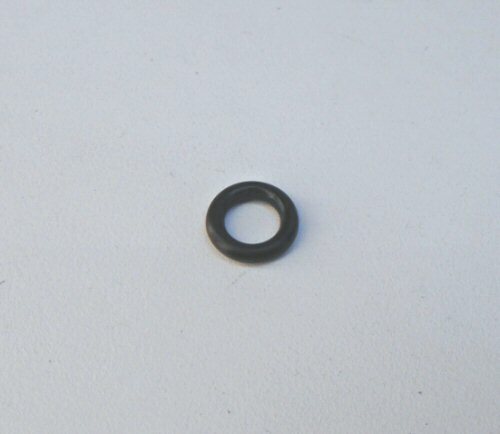 The late-type pushrod seal (GU1408-5900) will probably come out with the pushrod as they tend to wear on the outside. The earlier plastic tube (GU1208-5901) tends to stay in the input shaft. If either version of the seal remains within the shaft you will need to find something with which to draw it/them out. Use a needle for the cone-shaped seals and a small screwdriver for jamming into the plastic sleeve. To install the new o-rings, space them over the first four inches of the smoothest end of the pushrod. Insert the opposite end into the input shaft up to the first o-ring. Using a very small screwdriver or the throwout bearing inner body, gently press each o-ring individually into the shaft. When all are contained within the shaft, put a dab of grease on the back end of the pushrod and install the inner body and the throwout bearing. It’s a good idea to grease the bearing as well so it’s less likely to fall off. Clean and grease the outer body (and replace the o-ring for good measure) and use it to gently press the pushrod and o-rings into position. If you have completed this procedure on the bench you can now admire your work by moving the pushrod forward and back to feel the smooth and consistent drag of the o-rings.